When Chris and I got married I only knew how to cook two dishes, and Chris would only eat one of them. I was never allowed in the kitchen growing up because I had a unique talent for burning anything I touched. I put a cookie in the microwave once to warm it up and it caught on fire (true story). So I had to learn quickly how to feed my new husband because I was not about to let us starve or waste money on eating out all the time. Three years later I can honestly say that I love cooking in the kitchen. It’s so relaxing and is usually a nice way to end my day. Today I’m sharing some of my favorite items that I use in the kitchen. 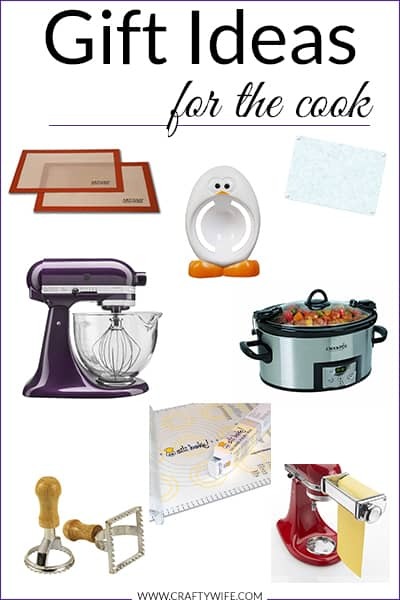 It’s the perfect gifts for the cook list because there is something for everyone, no matter what your skill level! 1. Kitchen Aid Mixer: This is a great gift for any cook no matter their skill level! I use mine for absolutely everything: shredding chicken, making cookies, mashing potatoes…everything! Madison from Wetherill’s Say I Do is currently giving one away, so you should go check it out and enter! 2. Glass Cutting Boards: I will be the first to admit that I had no idea you ween’t supposed to put meat on wooden cutting boards. I’d been doing it for years before I found this out and once I did I promptly threw them away and went out to buy glass ones instead. It’s more sanitary and they’re so much easier to clean! 3. Silicone Pastry Mat : I love using these when I’m making pasta and/or bread! It’s so much better keeping the mess contained in one place rather than having flour all over my counter. Make sure you get one that sticks to the counter and doesn’t slide all over the place though, it’ll save you time and frustration! 4. Kitchen Aid Pasta Attachment: I’m part Italian so I could eat pasta all day, every day and this makes it easier for me to do it. I love making my own egg noodles for Chicken Noodle Soup with it and being able to roll the dough it out without killing my arms. 5. Egg Yolk Divider: When making egg noodles this divider definitely comes in handy! I’m a fan because I do not like the feeling of raw egg in my hands…gross! I bought mine at Williams Sonoma last year but I’ve found some on Amazon that are even cheaper (like this one ). 6. Silicone Baking Mat: I love using these for baking cookies! They’re easy to use and easy to clean, plus they’re dishwasher safe which is another reason I love using them. 7. Ravioli Pasta Stamps : So, here I go again with the pasta recommendations! But really, if you want to have an easy go at making ravioli you need a press. I bought one from Williams Sonoma but you can pretty much get them anywhere. I love them! 8. Crock-pot: I am the master of the fix-it and forget-it meals and I love the crockpost for that reason. It’s so nice to just be able to throw the food in there and go about your day. You can check out my Pinterest board for some great recipes to try too. They’re all super delicious! Follow Teresa @ Crafty Wife’s board Delicious Crock-Pot Recipes on Pinterest. 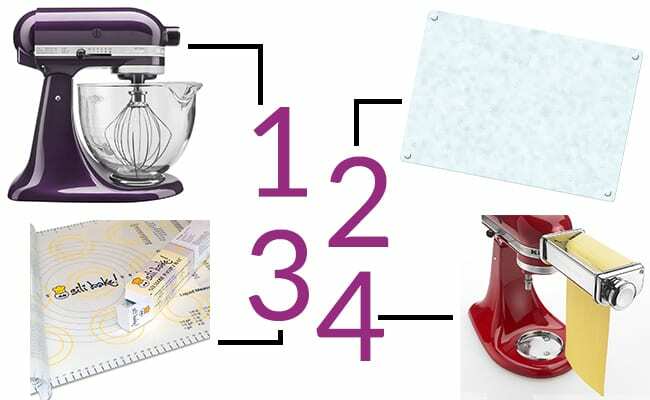 What is your favorite kitchen gadget that you’d give as a gift? Did I leave anything out? And if you’re looking for more holiday gift guide ideas check out my the 2014 Holiday Gift Guide on the blog! There’s a little bit of everything there.